Candelabra aloe – What is the best way to start growing Candelabra aloe? What are the difficulties growing Candelabra aloe? 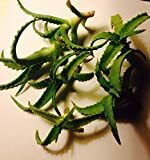 Candelabra aloe best way to start to grow it’s from cutting very easy and you get exactly as you put, the difficulties are the spines in the end of the leaves and can be danger for little children.